It’s Christmas time, and Karen is still off work following the injuries she sustained in Doggerland: Deception. Now, a man is found dead in a disused quarry, and it looks to be no accident. A bad bout of flu hits the police force, and Karen is called back to work early. Relieved to be able to avoid the family Christmas festivities, Karen makes her way to Noorö, where her team appear to be made up by some less than cooperative colleagues from the local police district. On New Year’s Eve another murder occurs, and the investigation unearths links to the local whiskey distillery. Clues suggest that the thousands of years old stone-ship monument, located on the northernmost tip of Noorö, might also play a role. In all of this, Karen is also concerned about her relatives on Noorö, who have a somewhat lax approach to the letter of the law, and may even have something to do with the murders. 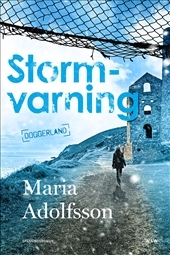 Doggerland: Storm Warning is the second book in the internationally bestselling series with Detective Karen Eiken Hornby in the lead. The Doggerland setting is a creation of the author’s imagination. The island nation Doggerland’s culture and language have roots in Britain and Scandinavia, making the ideal spot to set a Nordic Noir series with a twist.